Heavy snow has fallen on the mountains in Sa Pa district, northwest of Lao Cai province in Vietnam destroying most of the district's crops and causing traffic disruptions. This phenomenon is rare, but commonly occurs in the mountainous areas of northern Vietnam during the winter season. Compared to previous years, this situation is the worst to ever happen in the region. According to the Department of Agriculture and Rural Development more than 100 hectares of fruit and flowers have been covered with heavy snow. In addition, heavy snow is blocking the 10 kilometres of the highway connecting the provinces of Lao Cai and Lai Chau, but efforts are underway by the local authorities to remedy the situation. The cold weather has also forced more than 8,500 primary and secondary schools to closed for a while. Meanwhile, according to reports from the Department of Education and Training, Lai Chau, thousands of schools from the area have been hit by the snow that is in Sin Ho, Tam Duong Phong Tho, and ordered the students to stay at home. "Students from 63 schools in Sa Pa, including 20 kindergartens, 22 secondary schools and 21 primary schools, have been ordered to stay at home for precaution. To prevent any unforeseen risks, blankets were distributed to the students." The whole area in Lao Cai province recorded a temperature of 5 degrees Celsius and in Sa Pa the temperature 3 degrees Celsius below freezing stage. 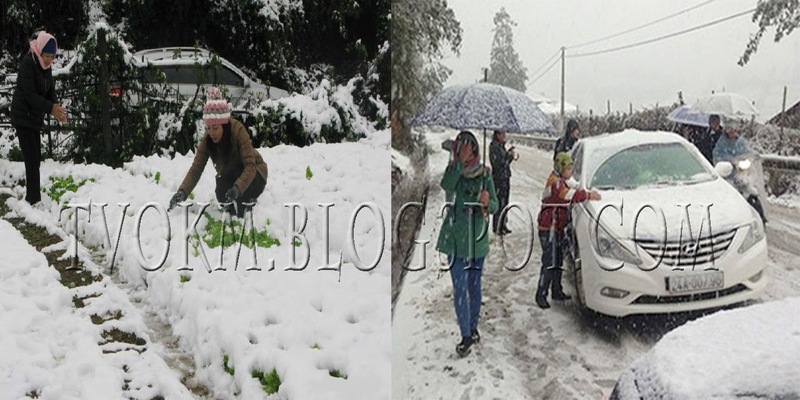 The phenomenon of extraordinary snow has caused the Lao Cai province to has become a tourist attraction.